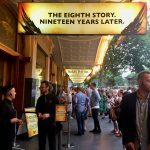 Louise’s Pre-Cursed Child Post: Anticipation, Head-scratching, and Curry. 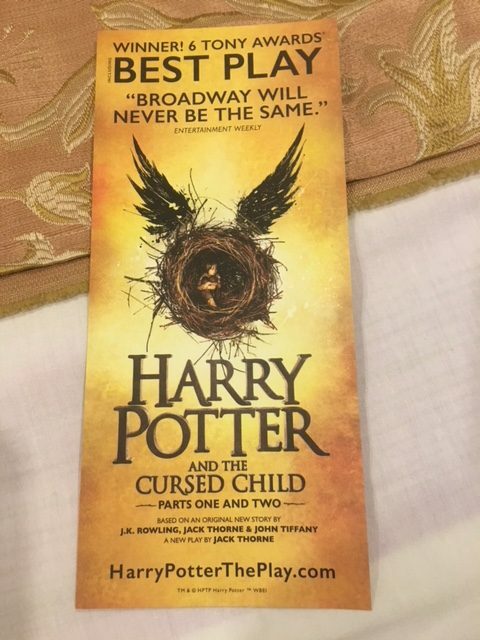 It’s Cursed Child Eve for this Hogpro faculty member, as, almost exactly a year after I snagged tickets to the Broadway production, I caught the train to NYC from Charlottesville for the big show. I opted for the one day version, so Parts I and 2 are both tomorrow. A long day of theater-going, to be sure! Headmaster John asked me to write up both pre- and post-performance productions. Confession time… while I read the script through twice when it was published in July 2016, I intentionally have not picked it up since, knowing that I would someday see the play and wanting as fresh a take as possible. In a perfect world, I would have seen the play before reading the script, but, I couldn’t wait three years. Thus, while John insists he would have read the play multiple times in the weeks before the show, so as to best be on alert for any changes, I took the opposite approach. I did, however, re-read the previous posts I had written about the script (here, here and here), as well as listen to the MuggleNet Academia episode I recorded on the topic. Another must-read was Elizabeth Baird-Hardy’s brilliant essay of the Oedipal connections to the script. So, if you want to know my thoughts on the script itself prior to the show, you can go there. 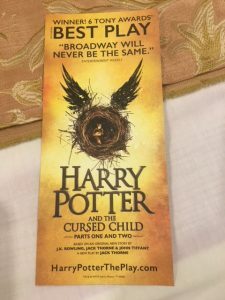 In the absence of fresh script thoughts, I will share a bit of my Cursed Child Eve festivities in the Big Apple. We arrived in mid-afternoon, just in time to check out our decidedly “cozy” hotel and do a little sight-seeing. 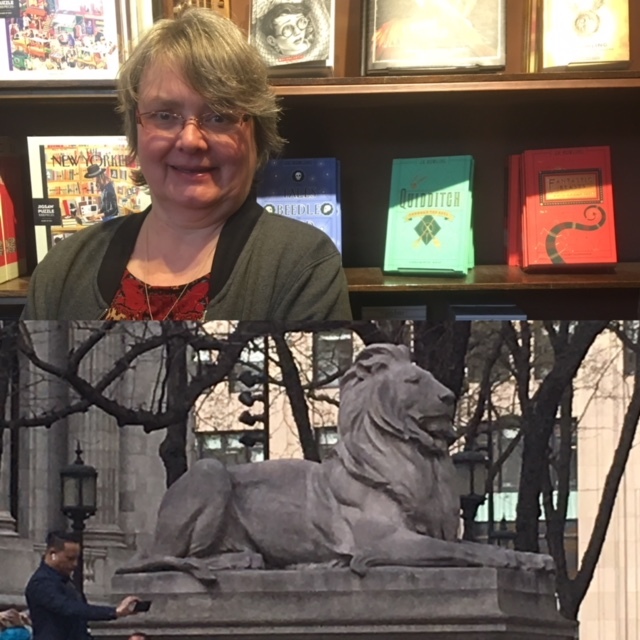 After a stroll by the Empire State Building, we visited the NYC Public Library, which turned out to be a great place for getting into the Potter spirit. Not only are there awesome lions– that’s the very Gryffindorly-named Fortitude, above– there was an entire display of Harry Potter material in the library gift shop, including, of course, the Cursed Child script. Then, we walked over to the Lyric Theater itself, where the show will start at 1 PM tomorrow. The gift shop there was open as well, and my husband requested I visit today, before I got overly intoxicated by either the production itself or the drink to which our Headmaster has promised to treat me. 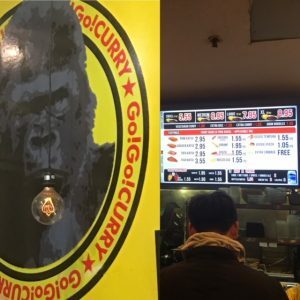 As it turned out, his fears that I would go crazy in that retail establishment were groundless. I noticed on the picture of the house banners outside the theater that a couple of the House color schemes were off. Gryffindor and Slytherin were OK, but Hufflepuff was a light gold, almost beige, paired with a muddy brown. rather than the yellow and black of the series. 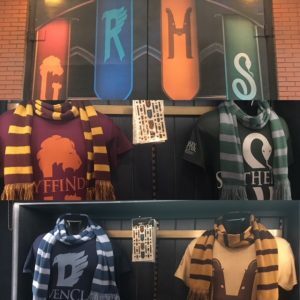 Ravenclaw, already corrupted from the books’ blue-and-bronze to the blue-and-grey of the movie merchandise, was even worse: a royal blue paired with a sky blue. (Bleah!) 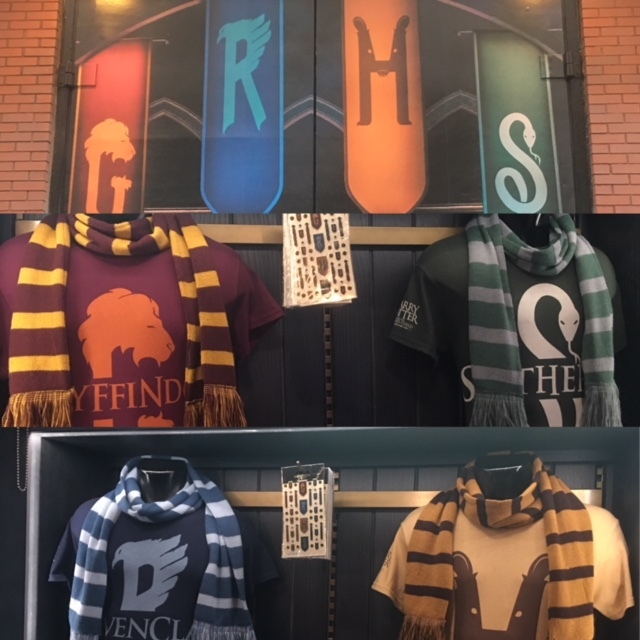 As you can see in the photo, the faulty color scheme was repeated in the t-shirts, ties and scarves sold in the theater souvenir shop. This pretty much kills any chance I will add to my Ravenclaw swag collection here. On top of that, a lot of the key-chains, pens, etc. carried the slogan “The 8th Story, 19 Years Later.” If you perused the posts and podcasts, you know I think it was a mistake to marked this as the “8th book” in the series, since it clearly is not. 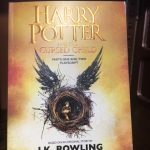 The opening dialogue on Platform 9 3/4 does not match either the book’s or the film’s; where Harry is clearly shown to have a loving relationship with Albus Severus and be OK with him being a Slytherin. 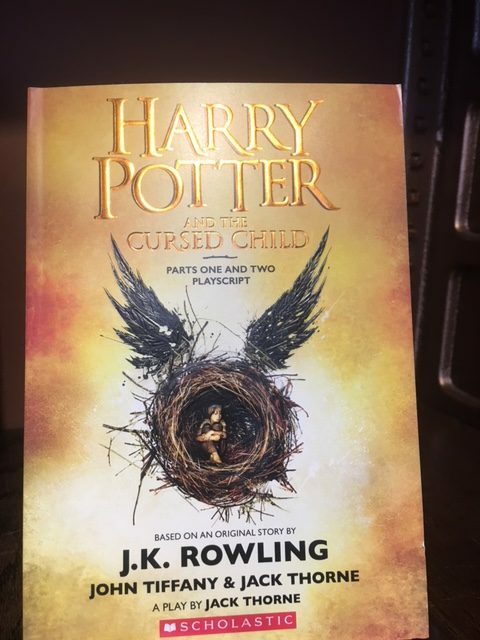 That fundamental precept must be changed if the Cursed Child storyline is going to exist. For that reason, I belong to the camp that rejects the play as canon, and considers it a fan-fiction adjunct, albeit the best type, the kind that gets the approval of the Author Herself. So, while I am greatly looking forward to the theatrical spectacle tomorrow, I think I will let my “Best Play” flyer, above, be my only souvenir. Unless that promised drink comes in a keepsake goblet or cauldron…. The final fun bit? 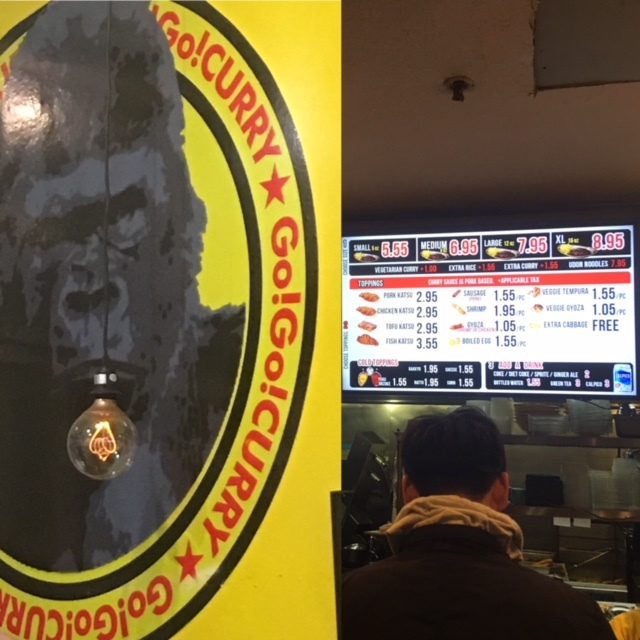 Our hotel is located directly over this awesome little take-out curry place, where we ate a delicious dinner after our touristing. It was enough to help me imagine being in London with Cormoran, Robin, Nick and Ilsa. Back tomorrow with a review of the play itself! Looking forward to your impressions once you’ve seen it. I, too, was dismayed at the color changes in the house gear. Especially as I seem to be testing as a Hufflepuff recently!!! Hope you enjoy it! 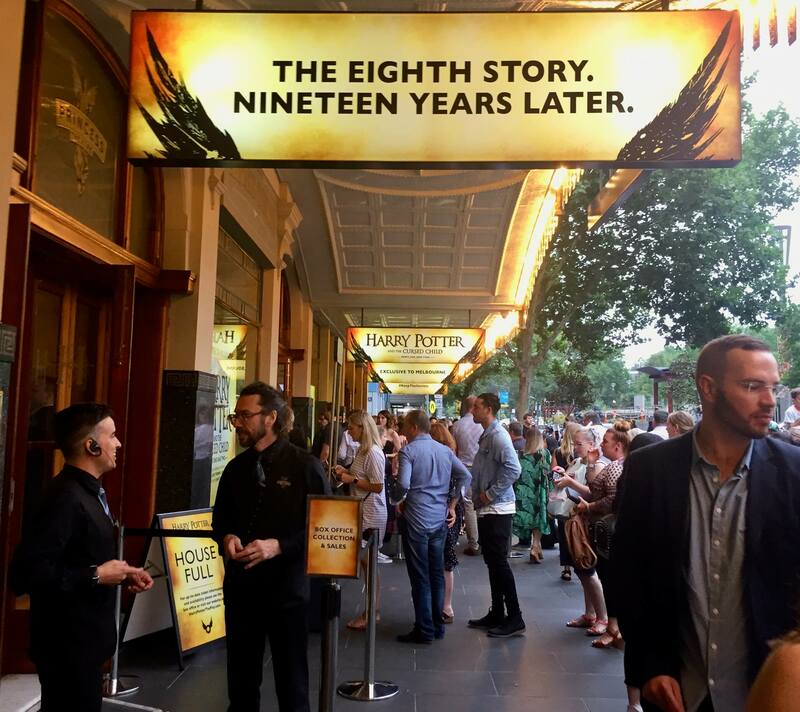 I really did – and all the more so for having read the script and not coming to it ‘clean.’ That got me over the disappointment of the Time Turner based plot and freed me to really enjoy the stage-craft. It was the best produced show I’ve ever seen.